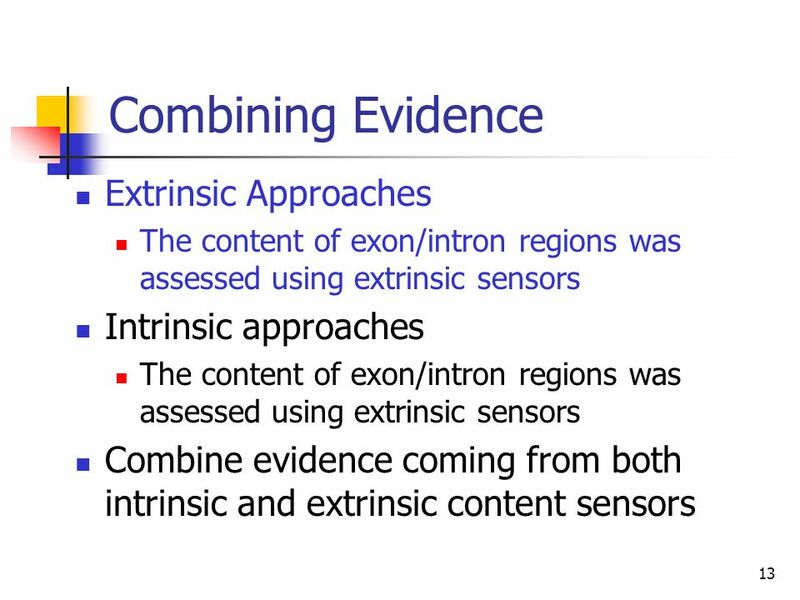 4 Combining Evidence In theory, each consistent pair of detected signals defines a potential gene region (intron, exon or coding part of an exon). 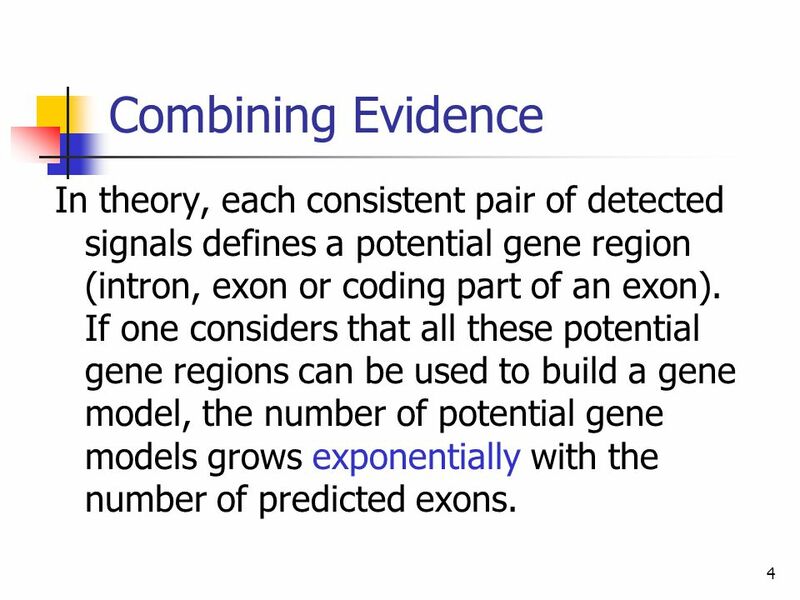 If one considers that all these potential gene regions can be used to build a gene model, the number of potential gene models grows exponentially with the number of predicted exons. 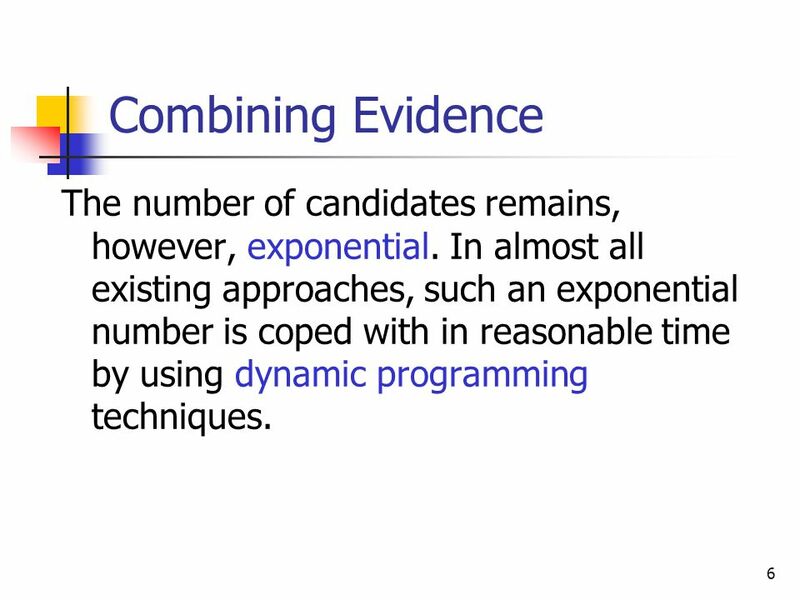 6 Combining Evidence The number of candidates remains, however, exponential. In almost all existing approaches, such an exponential number is coped with in reasonable time by using dynamic programming techniques. 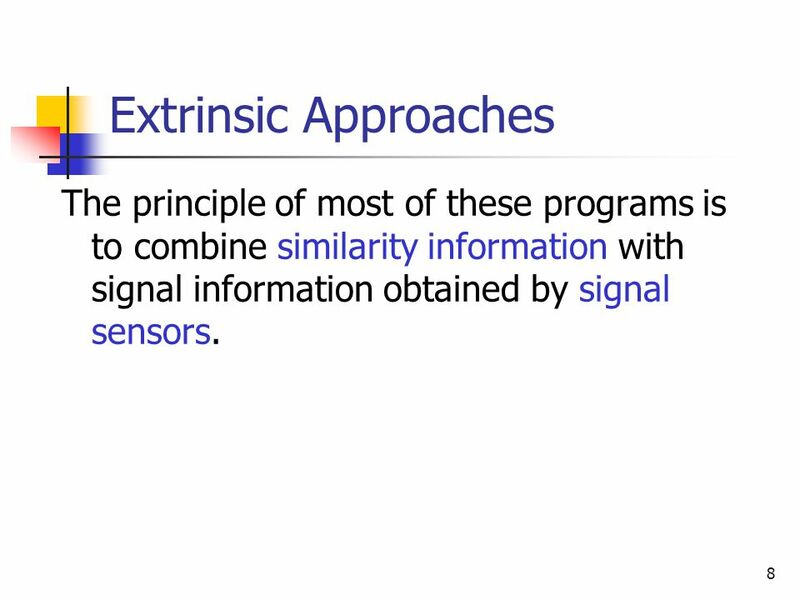 8 Extrinsic Approaches The principle of most of these programs is to combine similarity information with signal information obtained by signal sensors. 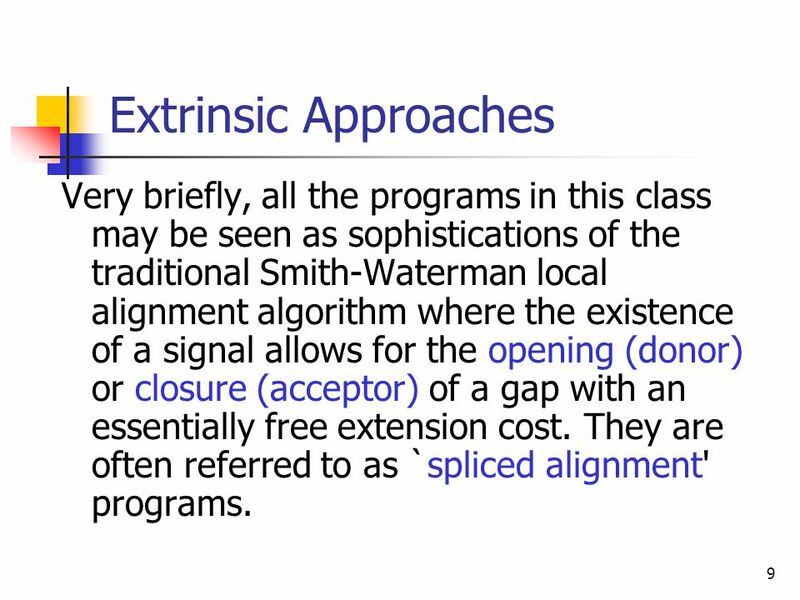 9 Extrinsic Approaches Very briefly, all the programs in this class may be seen as sophistications of the traditional Smith-Waterman local alignment algorithm where the existence of a signal allows for the opening (donor) or closure (acceptor) of a gap with an essentially free extension cost. They are often referred to as `spliced alignment' programs. 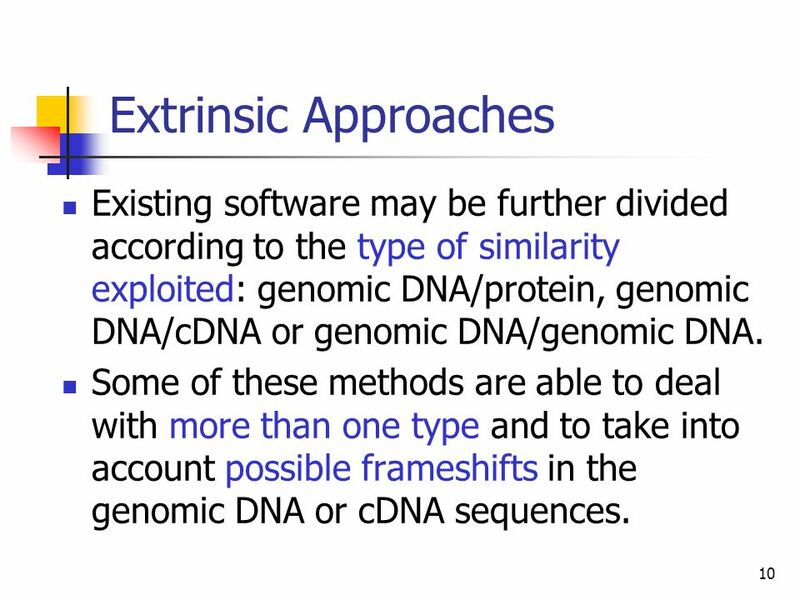 10 Extrinsic Approaches Existing software may be further divided according to the type of similarity exploited: genomic DNA/protein, genomic DNA/cDNA or genomic DNA/genomic DNA. Some of these methods are able to deal with more than one type and to take into account possible frameshifts in the genomic DNA or cDNA sequences. To align a genomic sequence with a protein. 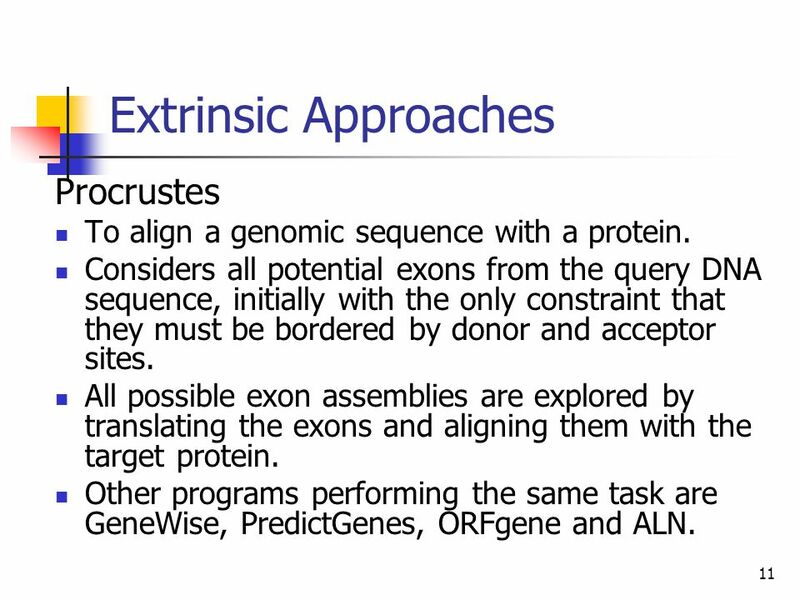 Considers all potential exons from the query DNA sequence, initially with the only constraint that they must be bordered by donor and acceptor sites. All possible exon assemblies are explored by translating the exons and aligning them with the target protein. 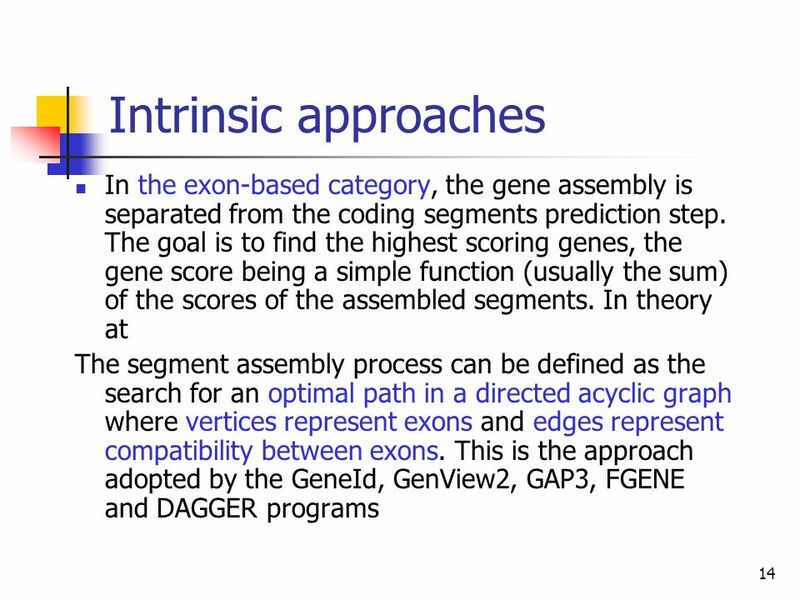 Other programs performing the same task are GeneWise, PredictGenes, ORFgene and ALN. 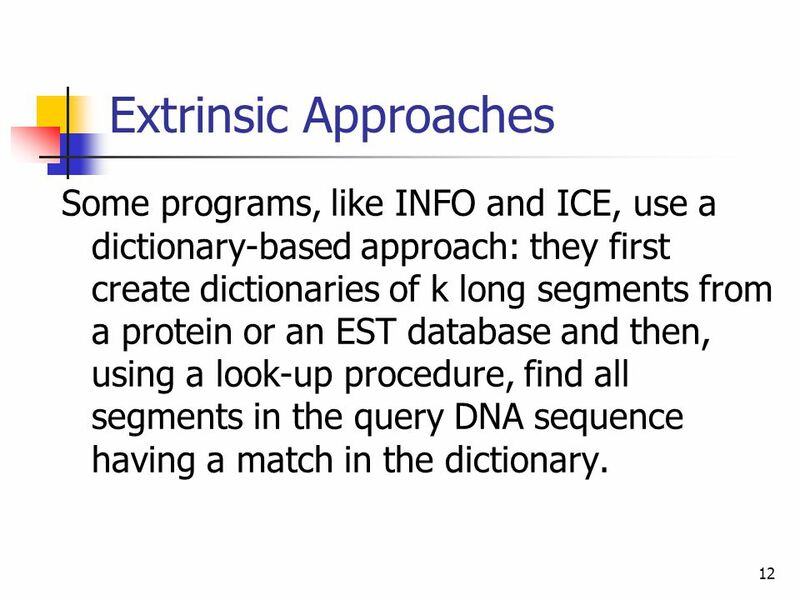 12 Extrinsic Approaches Some programs, like INFO and ICE, use a dictionary-based approach: they first create dictionaries of k long segments from a protein or an EST database and then, using a look-up procedure, find all segments in the query DNA sequence having a match in the dictionary. 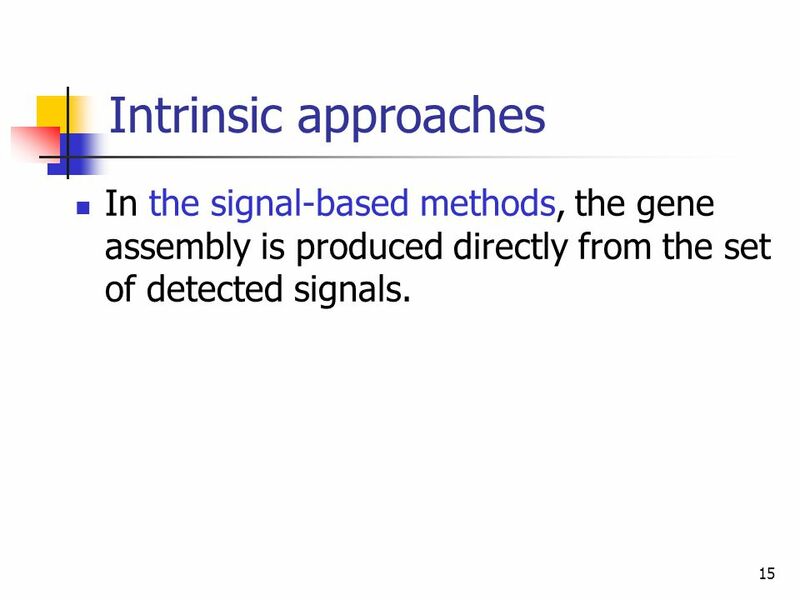 15 Intrinsic approaches In the signal-based methods, the gene assembly is produced directly from the set of detected signals. 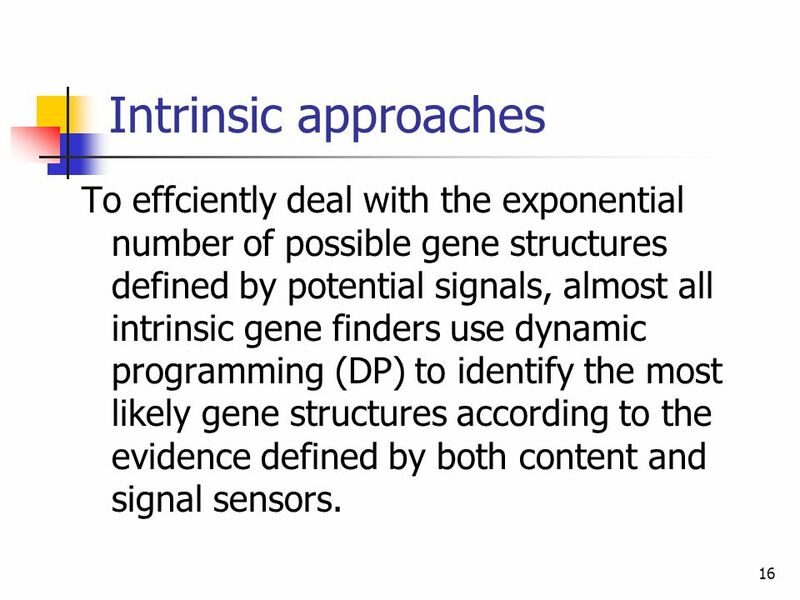 16 Intrinsic approaches To effciently deal with the exponential number of possible gene structures defined by potential signals, almost all intrinsic gene finders use dynamic programming (DP) to identify the most likely gene structures according to the evidence defined by both content and signal sensors. 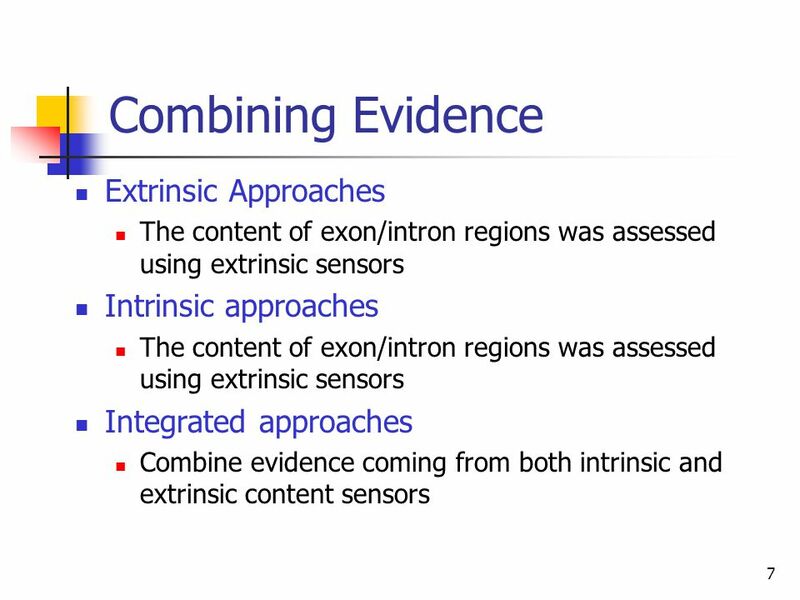 Combining both intrinsic and extrinsic. 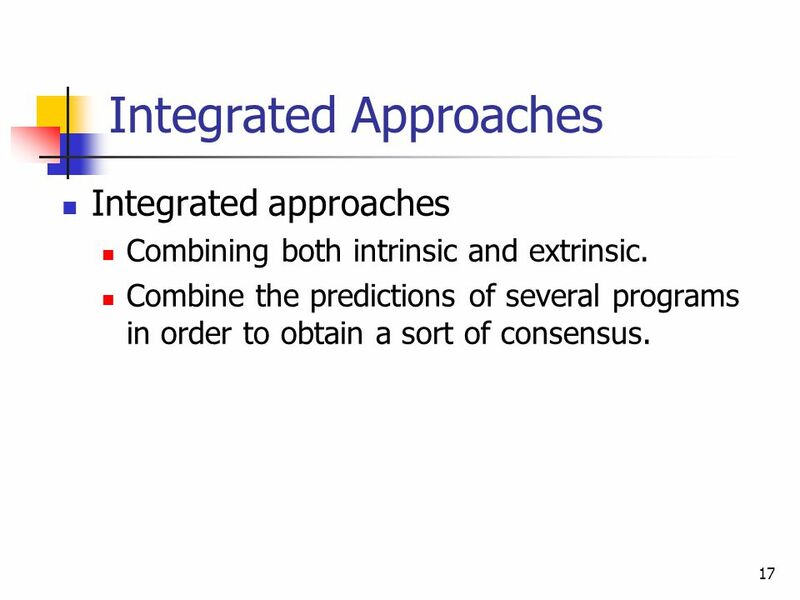 Combine the predictions of several programs in order to obtain a sort of consensus. 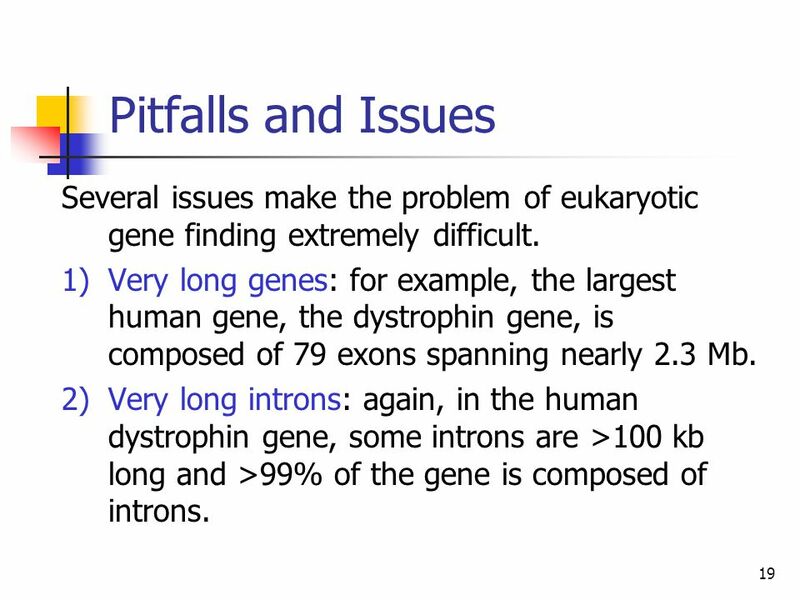 19 Pitfalls and Issues Several issues make the problem of eukaryotic gene finding extremely difficult. Very long genes: for example, the largest human gene, the dystrophin gene, is composed of 79 exons spanning nearly 2.3 Mb. Very long introns: again, in the human dystrophin gene, some introns are >100 kb long and >99% of the gene is composed of introns. 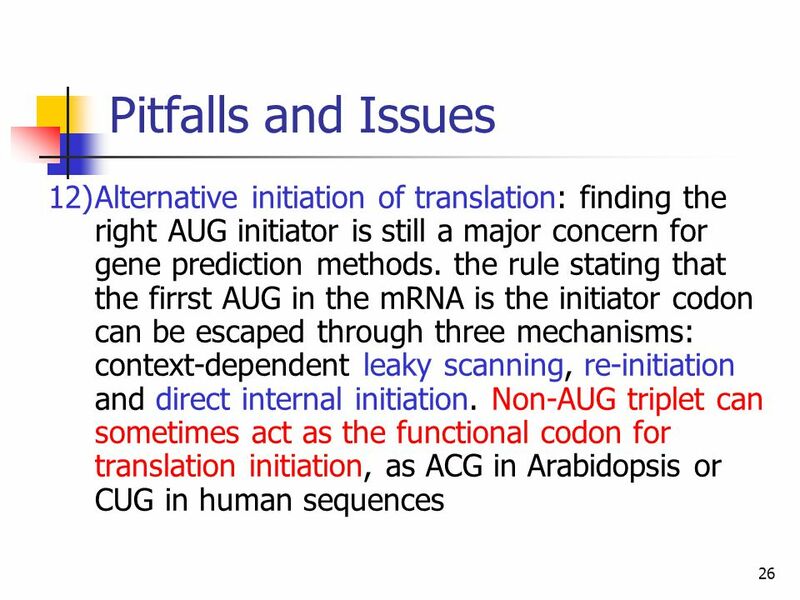 20 Pitfalls and Issues Very conserved introns. 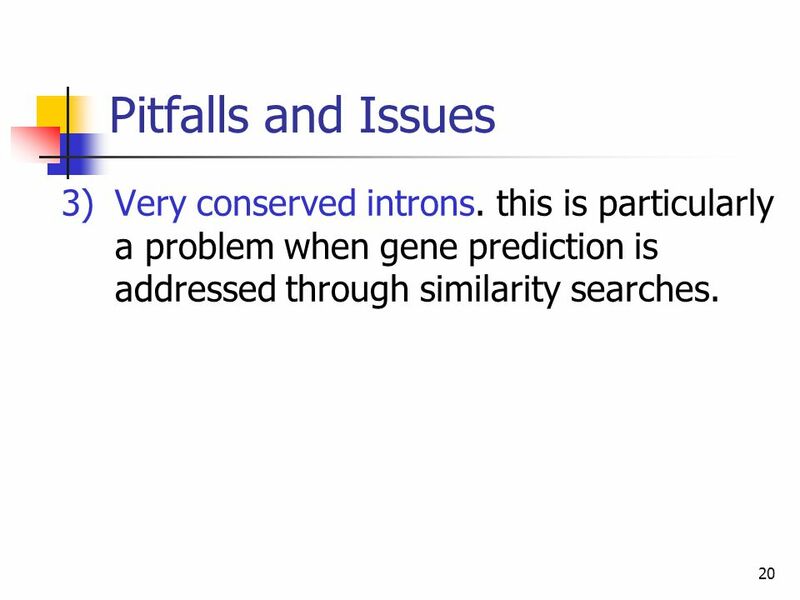 this is particularly a problem when gene prediction is addressed through similarity searches. 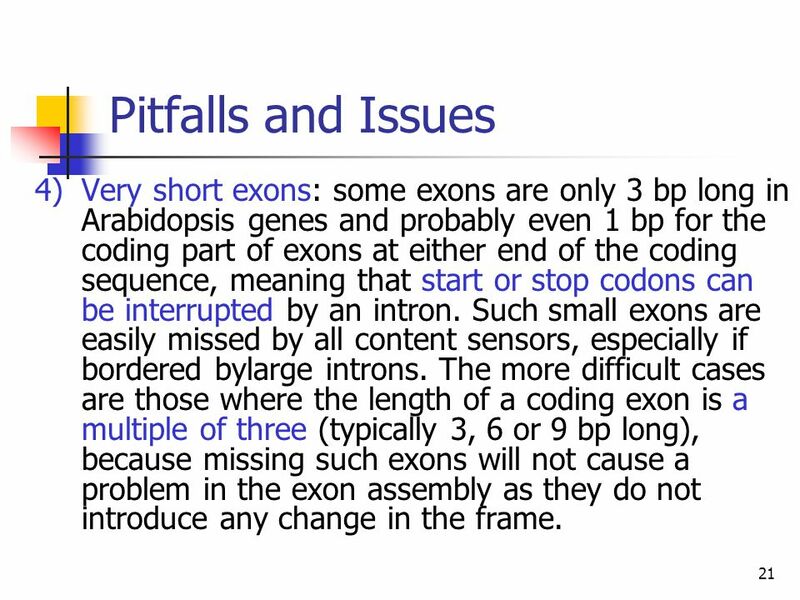 21 Pitfalls and Issues Very short exons: some exons are only 3 bp long in Arabidopsis genes and probably even 1 bp for the coding part of exons at either end of the coding sequence, meaning that start or stop codons can be interrupted by an intron. Such small exons are easily missed by all content sensors, especially if bordered bylarge introns. 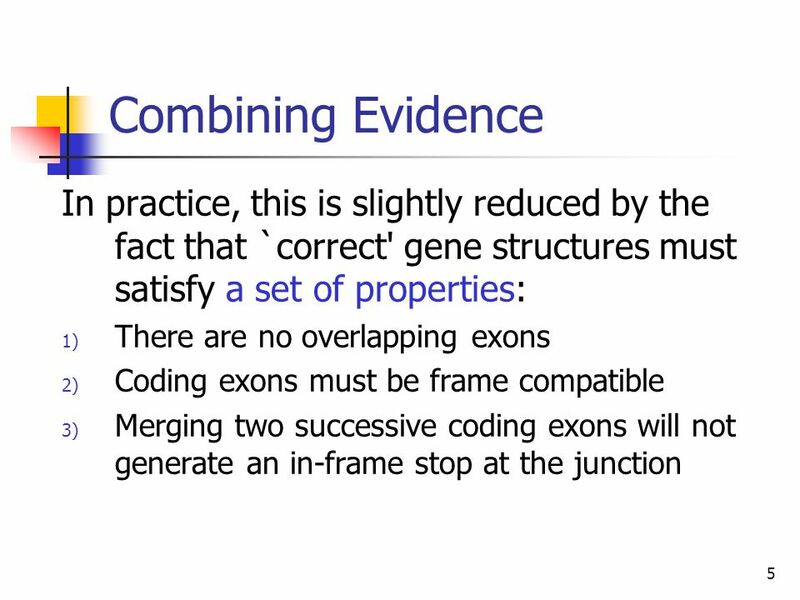 The more difficult cases are those where the length of a coding exon is a multiple of three (typically 3, 6 or 9 bp long), because missing such exons will not cause a problem in the exon assembly as they do not introduce any change in the frame. 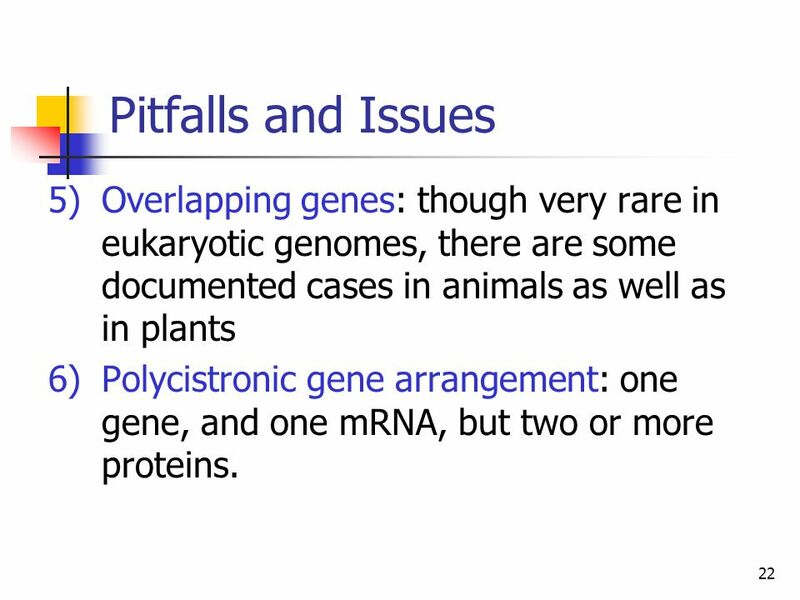 22 Pitfalls and Issues Overlapping genes: though very rare in eukaryotic genomes, there are some documented cases in animals as well as in plants Polycistronic gene arrangement: one gene, and one mRNA, but two or more proteins. 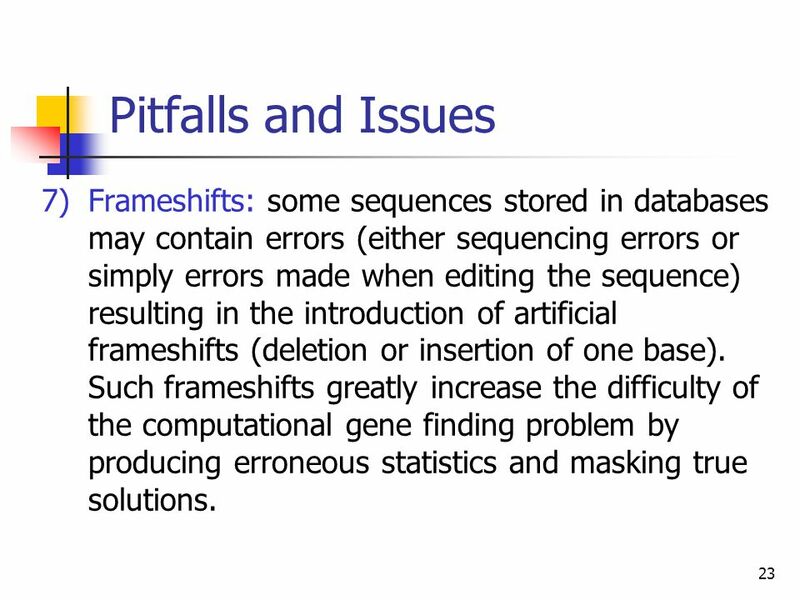 23 Pitfalls and Issues Frameshifts: some sequences stored in databases may contain errors (either sequencing errors or simply errors made when editing the sequence) resulting in the introduction of artificial frameshifts (deletion or insertion of one base). Such frameshifts greatly increase the difficulty of the computational gene finding problem by producing erroneous statistics and masking true solutions. 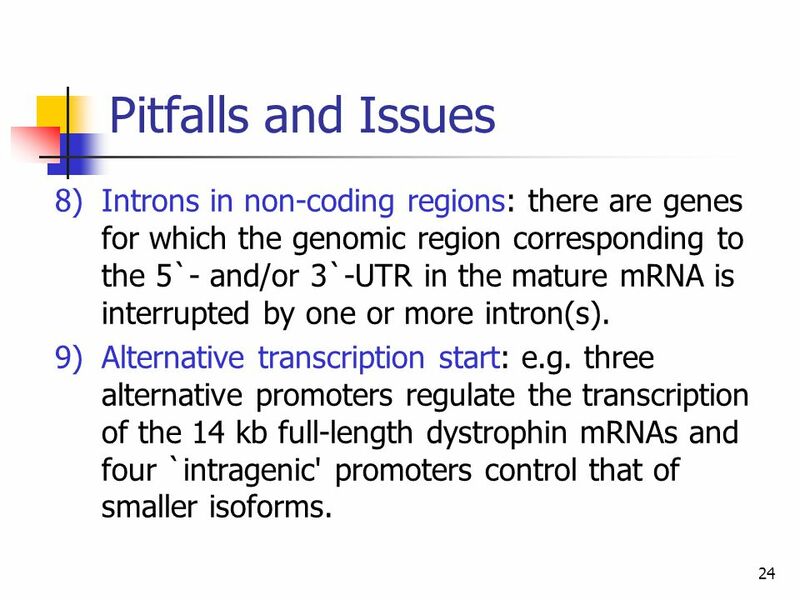 24 Pitfalls and Issues Introns in non-coding regions: there are genes for which the genomic region corresponding to the 5`- and/or 3`-UTR in the mature mRNA is interrupted by one or more intron(s). Alternative transcription start: e.g. three alternative promoters regulate the transcription of the 14 kb full-length dystrophin mRNAs and four `intragenic' promoters control that of smaller isoforms. 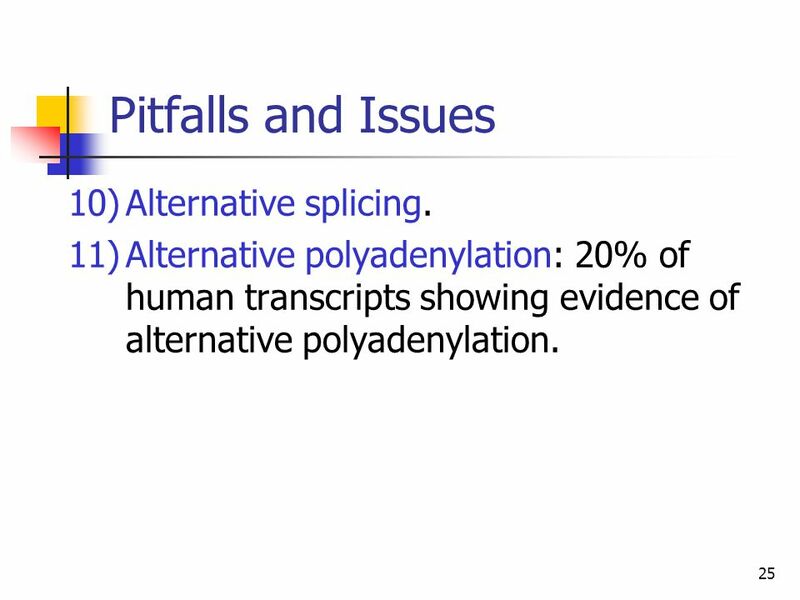 25 Pitfalls and Issues Alternative splicing. Alternative polyadenylation: 20% of human transcripts showing evidence of alternative polyadenylation. 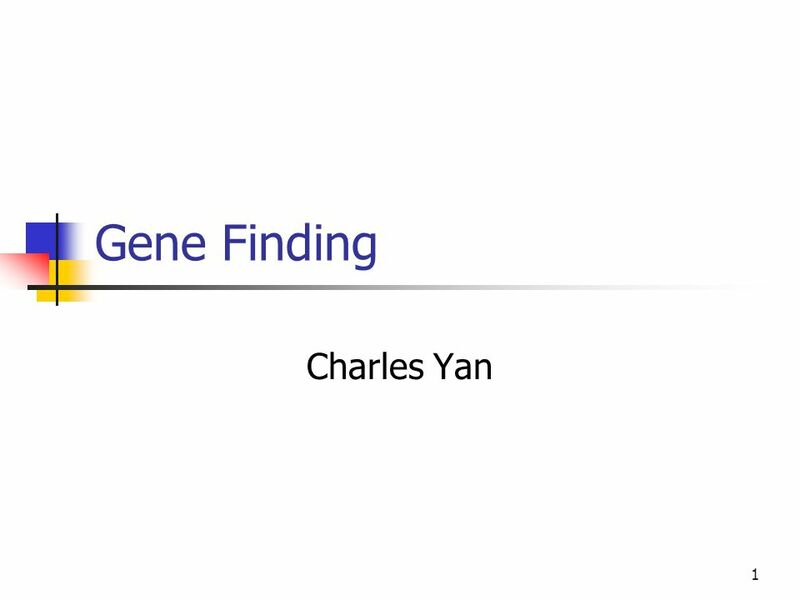 Download ppt "Gene Finding Charles Yan." BIOINFORMATICS GENE DISCOVERY BIOINFORMATICS AND GENE DISCOVERY Iosif Vaisman 1998 UNIVERSITY OF NORTH CAROLINA AT CHAPEL HILL Bioinformatics Tutorials. An Introduction to Bioinformatics Finding genes in prokaryotes. 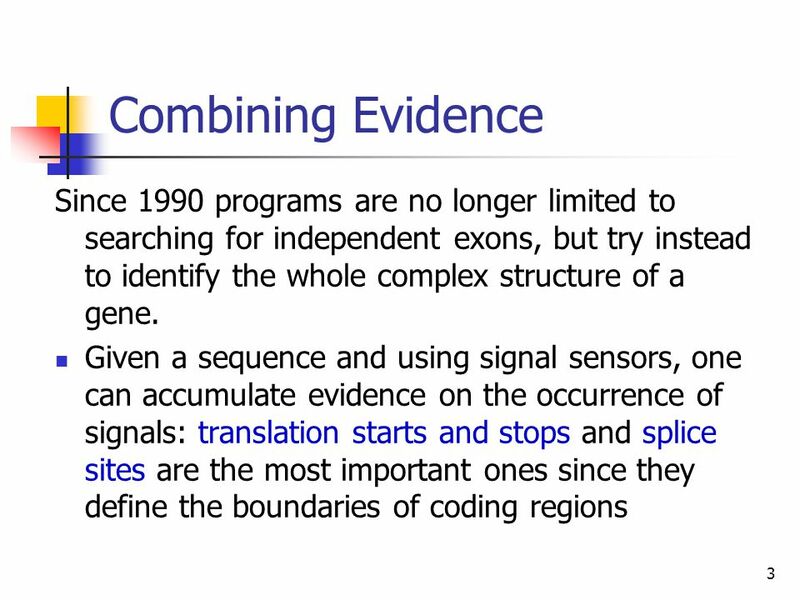 Genomics: READING genome sequences ASSEMBLY of the sequence ANNOTATION of the sequence carry out dideoxy sequencing connect seqs. to make whole chromosomes. Ab initio gene prediction Genome 559, Winter 2011. 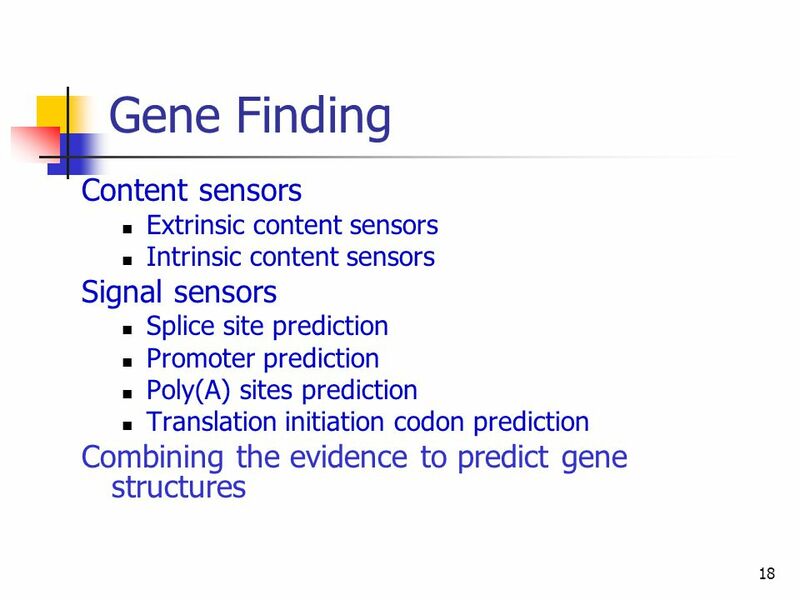 1 Computational Molecular Biology MPI for Molecular Genetics DNA sequence analysis Gene prediction Gene prediction methods Gene indices Mapping cDNA on. 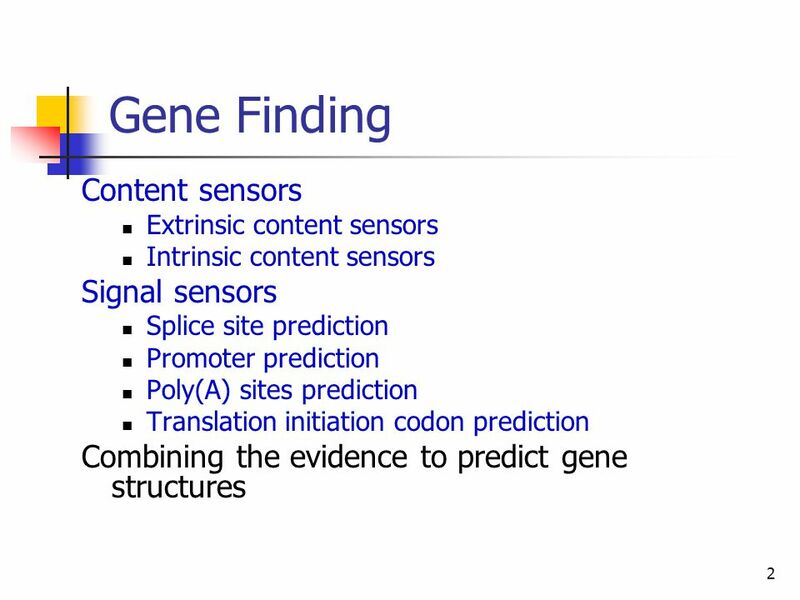 Gene Prediction Methods G P S Raghava. Prokaryotic gene structure ORF (open reading frame) Start codon Stop codon TATA box ATGACAGATTACAGATTACAGATTACAGGATAG. 10-1 Copyright  2005 McGraw-Hill Australia Pty Ltd PPTs t/a Biology: An Australian focus 3e by Knox, Ladiges, Evans and Saint Chapter 10: The genetic. CSE182-L10 MS Spec Applications + Gene Finding + Projects.